28-year-old man arrested for kidnapping two children. 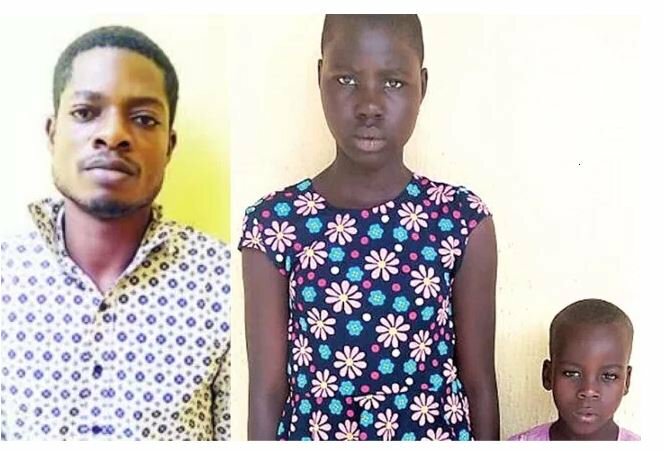 A 28-year-old man, Abiodun Joseph has been arrested by the Ogun State Police Command, for allegedly kidnapping two children. The victims identified as 12-year-old Tobiloba Aleshiloye and Yussuf Kudus, 8 were allegedly abducted on September 15, 2017. The suspect who resides at Cananland, Sango Ota, in the Ado Odo/Ota Local Government Area of the state demanded a ransom of N150, 000 each from their parents. The State Police Public Relations Officer, Abimbola Oyeyemi, said the parents of the abducted children reported the case to the police at the Agbara division and detectives trailed the kidnapper to a hotel in the Ojo area of Ibadan. “The two children were rescued unhurt and have reunited with their parents,” Oyeyemi added. The state Commisioner of Police, Ahmed Iliyusa has, however, ordered the immediate transfer of the case to the Anti-kidnapping/Cultism unit of the Criminal Investigation and Intelligence Department, Eleweran, Abeokuta.